For its first-ever CD edition, Cadenza prepares something truly special. Spread across two CDs, Cadenza Contemporary 0.1 & Classics is a distillation of the label's essence - not just an overview of its past, but also a teasing suggestion of what lies ahead. The first CD, mixed by Luciano, digs its fingers into the label's six most recent records, plus Luciano's own Tonerres, from the lone Cadenza Split Composition release so far - and teases out a single thread, which it rolls lovingly between its fingertips. The mix could have taken any number of different directions; Cadenza's last seven or eight releases, not to mention its entire 22-record run, offer a multitude of offbeats and accents that might serve as the stepping stones across the label's history. Luciano's mix takes the snakiest path possible, beginning with the blippy, aquamarine-colored house of Argenis Brito and Digitaline before taking a detour through Petre Inspirescu's sideshow psychedelia. When things get a little noir he opens the slats on Andomat 3000 & Jan's clattery Venetian blinds, making way for Rhadoo's percussive, mid-day reverie, all swirling dust motes and forgotten clocks ticking in the distance. Alejandro Vivanco brings a momentary wake-up call with his rubbery bass wallop, and then irreality descends again courtesy Luciano and Pikaya, delivering two of the deepest, most gravity-free tracks in Cadenza's catalogue. 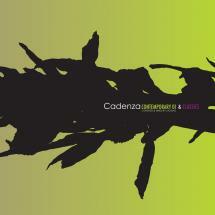 CD two highlights Cadenza's early years with a selection of classics culled from the label's first six releases, all of them appearing for the first time on unmixed CD. Luciano & Quenum lead off with the rightfully anthemic Orange Mistake, and Luciano & Pier Bucci follow up with the liquid Latin ripple of Amael. Quenum & Lee Van Dowski's Extension is as kinetic as anything the label's ever done, a hall of mirrors and circuit boards, while Luciano & Serafin's Funk Excursion goes straight for the gut-no need to bring your own funk, it's here in plentiful supply. Nsi. 's Max Binski remains at the frontier of Cadenza's outer limits: channeling free-jazz piano into an anxious, bass-heavy groove, it's one of electronic music's strongest tracks of the last half-decade, and its arrival on CD is cause enough to welcome this release. Finally, Luciano closes the disc out with Bomberos, one of Cadenza's earliest hits and a shining example of his way with a supple, slippery groove. Beautifully packaged in Cadenza's characteristically sumptuous designs, Cadenza Contemporary 0.1 is a milestone for one of electronic music's most important labels, and a tangible time-capsule to collect and keep.